Peter Rabbit's feud with Mr. McGregor escalates to greater heights than ever before as they rival for the affections of the warm-hearted animal lover who lives next door. Please log in or register to participate! It’s certainly a new spin, but those who make the leap will do so vigorously. The movie is absolutely not your grandparents' beloved book. But like Peter himself, you learn to grow with this update. Because this is a new generation's version of Peter Rabbit: one that honours the original while still being itself. If the freneticism gets repetitious, the target audience won’t mind, at least not judging by a preview crowd’s delirious reaction to a recurring electrified-doorknob gag. Yes, the two-minute trailers were an atrocious affront. But it turns out the other 91 minutes include thoughtful characters and some clever humor in between the pratfalls. While the film does insist on its own irreverence a bit too much at the outset...it offers plenty of lively fun once it settles down, and wisely keeps the pandering to a minimum. The animation technology is top-notch, but the gentle spirit of Beatrix Potter's books is subsumed into a chaotic, violent mayhem, manically soundtracked to the day's hits. 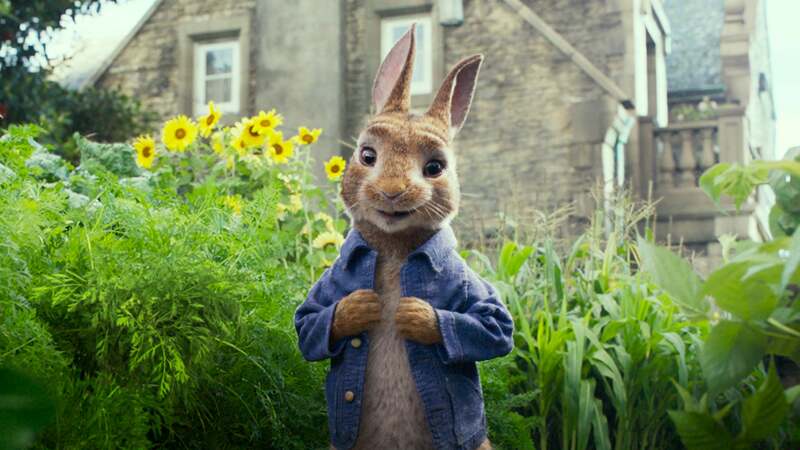 Peter Rabbit plays like a country cousin to Paul King's Paddington films, similarly balancing slapstick, absurdism, and a touch of gross-out humor, though without King's transcendently oddball sensibility. This kids’ animation is altogether lively and funny with just enough soul, even if it comes at the expense of Potter’s sensitivity and delicacy. The animals are cute and Gleeson is extremely game. What keeps Peter from Paddington-style delight is a self-conscious need to distance itself from its source material. Its story line is clean; the live-action actors, particularly Rose Byrne (as Bea, an artist who paints portraits of the bunnies), bring their onscreen-appeal A game; and the computer-generated animals are charming, albeit lacking in the particular gentle winsomeness of Potter’s originals. For a Brit-inflected talking-animal picture in the wake of the "Paddington" series, it’s not good enough. The relentlessly slapstick Peter Rabbit may please the kids, but the film never quite realizes its full potential. This “Peter Rabbit” has certain charms, chief among them the bond of fondness between Peter and Bea, and the cinematography by Peter Menzies Jr. (whose father shot 63 episodes of “Skippy,” a once-beloved Australian TV series about a boy and his kangaroo). The rift that opens between Bea and the two combatants feels somehow terribly contrived. From there until the requisite happy ending, the story loses some of its emotional weight, if not its humor. While Potter devotees will no doubt be scandalized by the edgier bad-boy ‘tude now possessed by Mr. McGregor’s mischievous cotton-tailed nemesis, the greater offense committed is the awfully flimsy plotting that fails to take full advantage of terrific production values and the work of an engaging cast led by the affably energetic James Corden. Gleeson and Byrne actually make for an appealing double act, and their scenes together are fun enough to make you wish that Gluck had ditched the digital animals and made an all-human countryside screwball instead. For anyone familiar with the original Peter Rabbit, it’s a little depressing to see its storybook charm reduced to slapstick. You can only see a person get electrocuted so many times before the gag wears thin, and with it the movie’s welcome. Peter Rabbit feels obligated to point out all of the clichés that it’s rehashing, in the mistaken belief that doing so absolves itself from coming up with anything better to replace them. Yes, it’s impressive from a visual effects standpoint.... However, had Potter lived to see what Hollywood has cooked up for her mischievous hero (who was sent to bed without supper in her own didactic tale), she almost certainly would have preferred for Peter (charmingly voiced by James Corden) and his three more cautious sisters...to have wound up in one of Mrs. McGregor’s infamous rabbit pies. The movie...resembles a sloppily tended garden plot where crude sight gags and violent set-pieces flourish like weeds, but anything resembling actual humor or delight refuses to take root.